The first step to finishing any woodworking project is sanding. Whether you choose to use any type of power sander or to sand by hand, you need to select the right type and grit of sandpaper. Sanding with the wrong sandpaper could irreparably damage your handiwork. Sandpaper is graded based upon the number of abrasive particles per square inch that make up the sandpaper. The lower the number, the more coarse the grit. Sandpapers are commonly graded as coarse (40 to 60 grit), Medium (80 to 120), Fine (150 to 180), Very Fine (220 to 240), Extra Fine (280 to 320) and Super Fine (360 and above). Sanding with progressively finer grits removes the scratches left by the previous paper and eventually leaves a smooth finish. 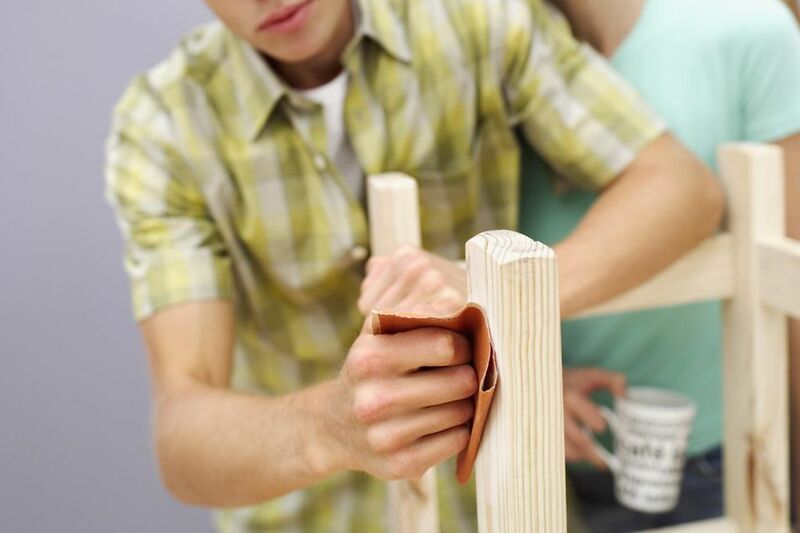 You might be asking, "Why can't I just sand the entire project with Super Fine sandpaper?" Well, there's nothing saying that you can't, but coarse grit papers will remove material fast, and when followed by finer grit papers, makes for much easier and quicker sanding. As almost any experienced woodworker will tell the beginner, the quicker you can get through with the sanding, the better. There are two primary types of sandpaper: commercial grade and industrial grade. The differences lie in a few areas, namely the material used as the grit, the backing material (paper) and the glue used to hold the grit onto the paper. Industrial grades use higher quality materials for all three components. Additionally, you may see sandpapers that are rated as either "open-coat" or "closed-coat". The difference is that closed-coat sandpaper has the grit particles grouped more closely together, where open-coat sandpapers have larger gaps between the particles. As a general rule, open-coat is typically better for woodworking, as it clogs less often, particularly when working with softwoods that contain more resin. There are five main types of sandpaper available, but not all are conducive for woodworking. Glasspaper, also known as flint paper, is lightweight, typically a pale yellow color. Glasspaper disintegrates easily and is rarely used for woodworking. Garnet paper is usually a brownish-red color, which is commonly used in woodworking. It will not sand wood as quickly as other sandpapers but leaves a better finish. Garnet is an excellent choice for finish sanding. Aluminum oxide is another common type of sandpaper for woodworking projects. It is the type of paper most often used in power sanders. Aluminum oxide is more durable than garnet paper but doesn't leave as nice of a finish. Silicon Carbide paper is typically a dark gray or even black. This type of paper is used primarily for finishing metals or for "wet-sanding", using water as a lubricant. While some advanced finishes use Silicon Carbide paper, it is not typically used in woodworking. Finally, Ceramic sandpaper is made of some of the most durable abrasives available and can remove considerable amounts of material in a hurry. Ceramic paper is often used for belt sander belts but sometimes is used for hand shaping of wood. It will usually leave a very rough finish, so exercise care when using Ceramic sandpaper, particularly on plywood and veneers, where it can quickly sand through the finish layer and ruin a piece. In most general woodworking applications, you'll likely find that starting with varying coarse-grit Aluminum Oxide papers for the initial sanding steps followed by finer-grit Garnet papers will leave a very smooth finish that will show off your woodworking skills and give you a very nice platform for staining or painting your woodworking project. Here's Why a 2x4 is Not 2" x 4"
What Safety Equipment Do You Need in the Woodworking Workshop?